The rising cost of a starter home, tighter mortgage rules, and a slower growth in personal incomes means that more and more people are having a hard time crossing the threshold into home ownership. The challenge is particularly pronounced for young people and families in entry level jobs, or those who may be carrying student debt. For many of these people basement suites, rentals, or a bedroom in their parent’s home may be all they can afford. Conceived by City Council in 2006 in response to rapidly escalating housing prices, First Place was a decision to create greater housing opportunity in Edmonton for young people and families. The goal of the program is to increase the supply of starter homes, and help get people into their first home. Recognizing that single-family dwellings are becoming out of reach for most first-time buyers, Council directed that administration build townhomes, which is increasingly how young people begin home ownership. First Place is targeted to help people just outside the market: recent graduates with student debt, young families and young professionals living at home, or in apartments. From the beginning, City Council directed City staff to work with the local new home builders and banks to determine how to help people enter the housing market. Out of that collaboration, a strong program has been developed, and the banks and builders play an ongoing role in its implementation and success. 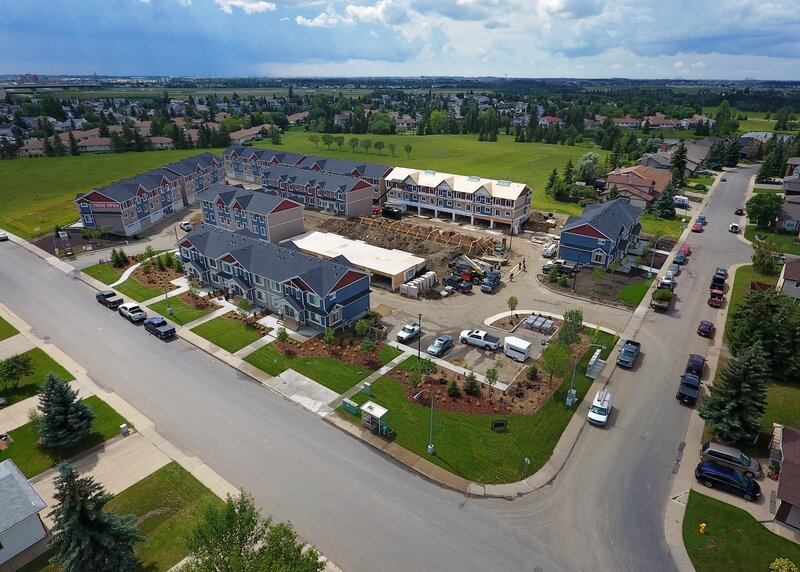 The City of Edmonton helps by providing the vacant building sites where homes can be built, and requiring builders to engage each community individually in the design of new home. In 2006, 20 school sites that sat empty for years before being declared surplus by local school boards were selected by City Council to be the building sites where the new homes would be constructed. This too is competitive, as buyers can choose what they like, and where they want to live. The two home builders for the First Place program were selected through an open and competitive process. After design consultations and engagement with the local community and approval of development permits, new home construction starts. Q: Is the land given, or sold at a discount? The land is sold to homeowners at current market value, which is determined by professional land appraisers. Q: Is there continued funding from the city for the program? There is no tax levy funding associated with development of the First Place townhomes. The costs of engaging local residents to design the homes and of building the homes is borne by the builder. Eligible purchasers pay for the cost of the unit, as well as relevant condominium fees, taxes and utility costs. There is a five-year deferral on the land portion of the mortgage, after which time the owner must pay the City the total amount of the deferred land costs. This five-year deferral gives the new buyer time to build some equity, gain stability, and increase their monthly income. Who is eligible to purchase a First Place home? There is some limited discretion on a site-by-site basis. One single mom with a divorce behind her did own a home previously. Program staff considered her situation and were able to waive that one requirement. All buyers must live in the home they purchase and belong to the condominium association which ensure homes and sites are well maintained. Buyers may not move elsewhere and rent out the home. After the five-year deferral period, the home buyers have the same rights and responsibilities of ownership as all other owners in the neighbourhood. What about the surrounding community? Local communities often have concerns around traffic and parking, and design of the new homes. When Council approved the program, they built in a requirement that members of the local community be directly involved in designing the new homes. The City recruits six to eight residents from the community through an open application process to work with the builder to help design the new homes and ensure they fit well with the surrounding neighbourhood. The design process usually involves three to four meetings over a two to four-month period, depending on design engagement participants’ schedules. At the first meeting, the City and the builder get feedback from the design participants on what they do or don’t want there, and to hear what they might be anxious about, such as height, traffic and sprawl. During the design process, many initial designs are presented to the participants for review and feedback. From there, the team works on revising the designs and comes back again for a further round. Parking arrangement: all developments now include drive-under units as part of their plan. In response to residents’ requests for greater transparency, updates on the status of the design engagement process, including meeting minutes and design options under consideration, are posted online following each design engagement committee meeting for the public to view. The local community also tends to have concerns around property upkeep and appearance. To respond to that, every First Place project is set up with a Condo board. The board looks after snow removal and lawn maintenance, and helps respond to any concerns arising from within or outside the new development. First Place also encourages involvement in the local community. They do this by providing community league memberships to new buyers as part of the package to encourage local involvement. As a result, they see these new neighbours getting involved in local community leagues and schools, and helping run community programming. Success and Failure: Is it working? Here is one significant and measurable sign of success: There have been no mortgage failures thus far! That doesn’t mean there aren’t situations when things go sideways. People sometimes need to leave before the five-year deferral had ended. One story is from a nurse who is a single mom and has a daughter in a two-bedroom townhome. But then she meets a guy (a cop), and he has two kids of his own. Now they need a larger family home. But it could be any number of factors: A dream job! A Divorce. Inheritance! New babies! When these situations arise, staff from the First Place Program are able to meet with them to discuss a few options. They may be able to sell to another qualified buyer for the balance of a 5-year deferral. Or they may pay off the deferral. When these situations arise, the City works with the home owner to determine the best course of action. There are also situations where someone breaks the rules and breaches contract. (Perhaps they move out and rent out the place.) Fellow First Place homeowners will often see this happen and report it. In these situations, the First Place staff has some tools with which to respond, including removal from the program and buying back the house. One young mom celebrates being able to have a separate bathroom for her teenage daughter. Home ownership often leads to family and new relationships. It is surprising how fast the babies come! Common spaces built into each development help create community with neighbours and other families. People in the local neighbourhood have to buy more Halloween candy and hand them out to cute kids. Kids are walking to school, again! Parents are often there to co-sign the mortgages, helping their kids find their feet, and often being close enough to share life as a young family begins to bloom. When parents see their kids become stable and healthy, it is a powerful gift. They have also seen children from the local neighbourhood able to buy in the neighbourhood they grew up in. Previous PostWhat’s Your Wisdom on Affordable Housing? – Mill Woods!Next PostHave You Seen Theo?